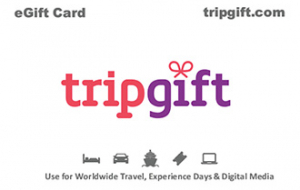 TripGift® offers the world’s best Travel Gift card and eCommerce selection for worldwide Travel, Experience Days & Digital Media with a unique choice of 450 Airlines | 330,000 Hotels, Villas & Apartments | 50,000 Things to Do | 2,000 Tours | 16 Cruise Lines | 500 Car Rental Providers | +Digital Media content (eLanguage courses) all with one eGift card which you can use to book instantly via online and mobile. Perfect for a short spa hotel escape, worldwide Flight + Hotel breaks, local or international Theme parks & Activities or why not book a Cruise trip. Great for work colleagues, Customers or Channel partners. At checkout enter your eGift card into the Redeem eGift card code field and click submit. A maximum of 3 eGift card codes are permitted per transaction, if your basket value exceeds the value of the eGift cards you may pay the difference by using Visa, MasterCard or American Express.